If you work as a developer in the Sitecore world, you will probably hear the term engagement value at some point. I did a quick Google (and got a 500 error, which made me think the world was coming to an end, but I’ve recovered from that now) and noticed that the majority of resources out there are geared towards marketers – and fair enough; it’s a tool for marketers. But as a developer, I think it can be easy to forget that an enormous part of the Sitecore platform is dedicated to optimizing the experience for visitors – whilst I’m silently cursing the existence of the TemplateID class and crying over line 230 of some repository layer, someone else is trying to figure out how best to gauge a visitor’s wine preferences and personalize their experience accordingly. Engagement value sits at the core of that. In this post, I’m going to explain what engagment value is,who is responsible for it, and how it impacts a developer’s job. Imagine that you run a site that sells cheese and wine. You think you’re popular – you get 10,000 visitors per day. However, 1 in 10,000 visitors actually buys anything. Your traffic is high (maybe you are some sort of SEO magician), but based on the sales metric alone, their engagement with your site is very poor. Traffic isn’t an indicator of how much money you are making – you need information about what those visitors are actually doing on your site. This is where engagement value comes in. Some of those goals are more important than others. If a visitor downloads a special offers coupon, they are clearly interested in purchasing whatever that offer entails them to – but it isn’t as important as actually parting with cold, hard cash. The more valuable a goal is to your business, the higher the engagement value associated with that goal will be. The bars represent total engagement value. If this was the data for our wine and cheese shop, we can see that people are engaging with our brand – in fact, email is generating rather a lot of engagement! Our sales might be low, but our marketing efforts have not been not a complete disaster – people are signing up for the newsletter, downloading special offer vouchers, and rating our products. Marketers can use this data to fine-tune their approach – why is nobody coming in from Facebook or Twitter? Have we omitted these channels? Is it really worth paying for advertising? Suddenly, you have a much more nuanced view of what is happening across the various channels available to you as a marketer. That’s all well and good – but what is my job in all of this, as a developer? Who decides how much a goal is worth? Deciding the value of a goal is definitely not a developer’s job. This is something that the business must decide, and it is recommended that they attend a scoring workshop (run by Sitecore Business Optimization Services – or ‘SBOS’) to work that out. As a developer or system administrator, you should expect to be given a list of goals and values to set up in Sitecore, and instructions on when and how these goals should be triggered. OK – I’ve been given my list. How do I actually configure goals? 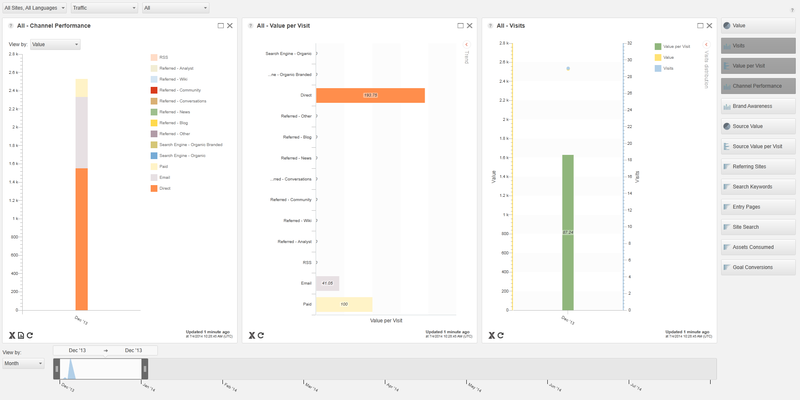 This will open the ‘Marketing Center’ portion of the Sitecore tree in a separate window. 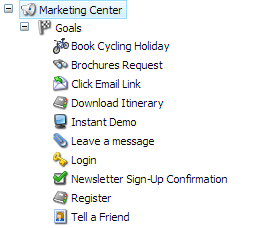 Alternatively, you can locate the Marketing Center via the Content Editor – it’s under /sitecore/system/Marketing Center. 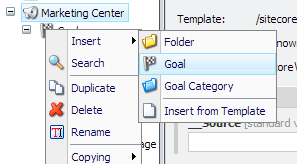 Note: At time of writing, I believe that putting your goals into subfolders (goal categories) might make it impossible to select them in Web Forms for Marketers (which does not expect sub-folders), so you may find that your goals need to be on one level. 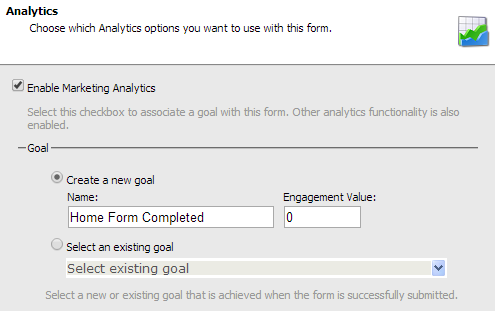 Behind the scenes, deploying a goal creates an entry in the analytics database for that goal. Tip: If you are using continuous delivery to deploy your site each time you make a code change, you will need to ‘re-deploy’ existing goals to make sure this row is created – see Andrew Thompson’s blog post for more details on goals and continuous delivery. And that’s it – your goal is now live and ready to be used. Coming up with a sensible engagement value scale and setting it up in Sitecore is one of the first things marketers will do as they start getting to grips with the Sitecore platform; even if it takes a little while to get going with personalization, testing, and content tagging, you are gathering data in that time. Goals can be triggered in a number of ways. In reality, although there is a way to assign goals to page items in the Content Editor, most goals are triggered programmatically. A visitor might land on your ‘contact us’ page, but they have not really engaged unless they clicked the email link or submitted a form. [b]Note:[/b] Since the goal name is stored as a string, you need to make sure that you do not have duplicate goal names. You can assign any number of goals to an item. I will reiterate that whilst this is a simple, UI-based way to assign goals to items, simply viewing a page is rarely a sign that someone is engaging. Traffic does not give you very much information about how a person interacted with your business, which is why Sitecore really pushes engagement value as a way for marketers to understand what their visitors are actually doing. Because this engagement value forms the core of how success is measured, most other marketing features will be based around engagement value – for example, the success of a test variation is measured in how much engagement it resulted in, not the number of clicks. 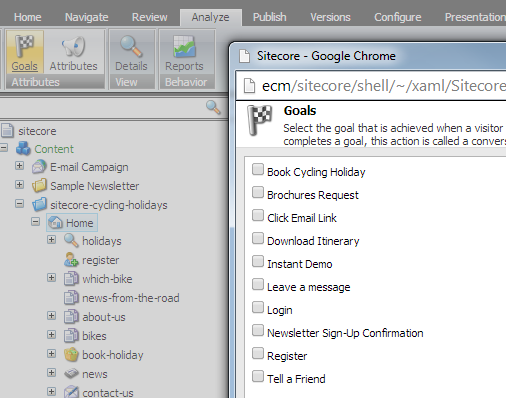 As a Sitecore developer, you will very likely be asked to trigger goals via the API at some point, and you may even end up wrapping the goal-triggering mechanism in a web API of some kind.However, the actual goals and the associated engagement value scale is something that the business stakeholders need to work on together with their Sitecore partner’s optimization experts. You can help your client by being aware of the options for triggering a goal, and the fact that certain modules will do this work for you automatically – like WFFM. Spot on with the conclusions. I just want to emphasize the point that Sitecore is not dismissing Traffic. Traffic still make a lot of sense; – it tell you how many people is coming to your website. While using engagement value, you still need traffic reports. Too often, marketers pushes additional funding into activities that apparently drives additional visitors to the website. Problem is that most often increased push in visitor acqusition generate proportionally less value. That’s money right out the window. More advanced web analysts have therefore decided to measure “conversions”, – that is the completion of a measurable goal. This work well to understand if a campaign, variance test lead to a specific conversion. Problem is, – what if you have a lot of value generating activities on your site, – and while a specific campaign increase a specific goal conversion, but negatively affect other conversions? Hey Martina, Thank you so much for sharing such a nice article. First time I understand the engagement concepts clearly.I would like to try this now.